The purpose of this web page is to make public the basic details of the Felmersham & Radwell Community Trust, so that the residents of Felmersham and Radwell can be aware of its origin, its objectives, and the way it is intended to be run. The late Margaret Alleway bequeathed the residue of her estate to the Felmersham and Radwell Community Care “for their general purposes”. When the estate administration was completed, that residue amounted to approximately £230,000. Accordingly, the Felmersham and Radwell Community Trust became officially registered as a charity in February 2004. The organisers of the Community Care, as the original beneficiary of Margaret Alleway’s will, have invited a group of six village residents to be the administrators of the new Trust, and to be registered with the Charity Commission as its Trustees. The Trustees are Peter Hartop, Jeffrey Stokley, Gillian Whiteway and Simon Whitham. They are responsible for all aspects of running the Trust. ii) to provide facilities for social welfare, recreation and leisure, again in co-operation with other relevant organisations, for the benefit of the inhabitants of these villages. The Trust still seeks to fulfil its aims to provide benefits to the residents of Felmersham and Radwell and to this end the Trustees have already allocated funds to several village organisations. They invite proposals from any organisation, or individual parishioner, to organise or suggest schemes for the benefit of the two villages. No scheme is too small (see Communications Group grant). 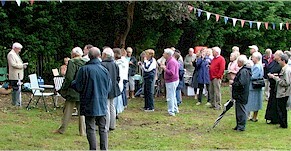 In addition to various grants being made to village organisations, the land adjacent to the Jubilee Lawn was purchased in 2007. This amenity not only allows parishioners river access for fishing, it also provides a peaceful environment in which to relax. The Margaret Alleway Memorial Garden was formally opened in August 2007. £3,000 St. Mary’s Church, being a share of the graveyard wall rebuilding costs. £112-54 PCC, being cost of consumables for Ouse News. £150 Cost of book tokens for village children, in celebration of the Diamond Jubilee. £50 F. & R. Table Tennis Club, being cost of a second-hand table. £500 Community Support - Contribution to the cost of a ramp for a wheelchair. £10,000 FELMERSHAM & RADWELL COMMUNITY CARE - donation to cover any expenditure that may be needed by them to operate their scheme within the Parish. £9,962 ST MARY’S CHURCH, FELMERSHAM - essential tree lopping; hearing loop system; path leading to the new parish burial ground; new nave altar (commissioned as a memorial to Margaret Alleway); replacement cushions for pews. £8.000 ST MARY’S CHURCH, FELMERSHAM - toilet and kitchen facilities. £10,000 PINCHMILL PRE-SCHOOL - grant for refurbishment of building. £16,204 FELMERSHAM & RADWELL VILLAGE HALL - refurbishment of committee room and toilets. £11,695 FELMERSHAM & RADWELL VILLAGE HALL - towards equipment for new playground equipment. £18 PARISH PLAN COMMUNICATIONS GROUP - publication of village Welcome Pack. £364 PARISH COUNCIL - renew halyard to flag pole/inspection of fittings. £2,000 FELMERSHAM & RADWELL YOUTH CLUB - donation for equipment and other "start-up" costs. The Trust has chosen to record their appreciation of Margaret Alleway's generosity by presenting to St Mary's Church a nave altar to her memory. Margaret was a regular worshiper at the church. Over the last few years a temporary nave altar has been used in St Mary's Church to assess reactions to this innovative idea. 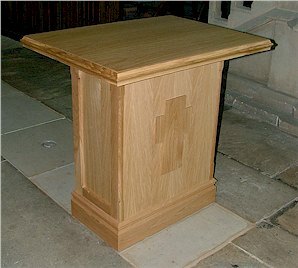 The response has been favourable so this portable altar has been installed which can easily be moved for non-communion services. As many parishioners know, the Trustees of the Felmersham and Radwell Community Trust (FRCT) were originally unsuccessful in their bid for the plot of river frontage land adjacent to the Jubilee Lawn. However, all bids were recently reconsidered and we are happy to report that ours was accepted, contracts have been exchanged and this plot of land now belongs to the villages of Felmersham and Radwell, but will be held in trust by the FRCT. It is a decent size plot and will be a useful river frontage amenity for villagers although a lot of hard work is required during the next few months, such as clearing, cutting, pollarding, grassing and hauling etc! We may be asking for working parties to help (remember the construction by villagers of the Jubilee Lawn, when a lot of hard work was involved but much more was gained in community spirit?) but we will keep you informed! It is envisaged that the hedge between the land and the public slipway will remain, this is because the Jubilee Lawn area belongs to the County Council and we wish to maintain the separation. Therefore access will be from the road. Once details for use have been established, maintenance will be provided by the Parish Council but the deeds retained by the FRCT on behalf of the villages of Felmersham and Radwell - a wonderful time for a parish party. More details as soon as we have them. 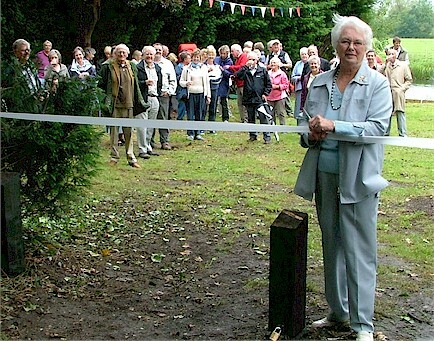 The Margaret Alleway Memorial Garden was opened on Sunday 19 August 2007. The land was purchased by the Felmersham and Radwell Community Trust as a memorial to the Trust's benefactor and to provide a parish recreational area next to the River Ouse. When completed the garden will be managed by the Parish Council.